The other night Hubby and I stayed up very late cleaning the floors in our basement. We had to clear out rooms, give them a good vacuum, then wash them in anticipation of carpet going on. 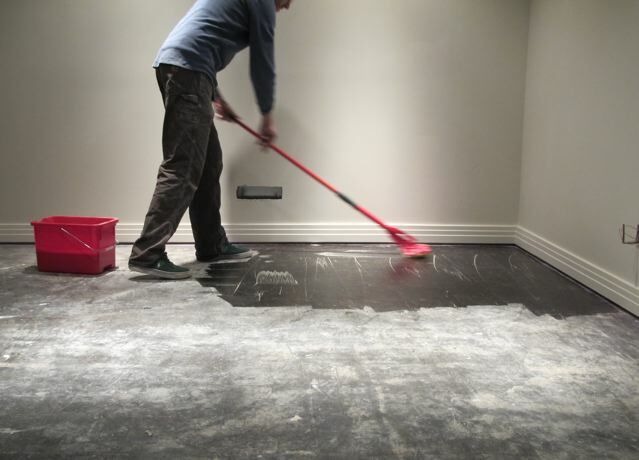 I couldn't help but think of the many late nights we spent with mops and a Shop Vac over seven years ago when we flooded. We are FINALLY in the home stretch of a reno that started, unintentionally, with a flood in the summer of 2005. A month of rain + a house built on clay soil - any sort of waterproofing on a 50 year old house + a cracked foundation = lots of water in the basement. Lots. It felt wrong to be celebrating colourful floors, finished baseboards and awesome wallpaper in the wake of Sandy and so much destruction for so many, but I had to remember that this was born of our own disaster. And we've worked very hard in the years since to get to this point. It's kind of been like the Old Lady Who Swallowed A Fly. To finish the basement we had to waterproof. To waterproof we had to dig a trench around our house. To dig the trench we had to rip out the driveway and tear down the fence. To tear down the fence we had to build a new one. To build a new fence we had to grade and landscape our front and back yards. And all that before we could think about walls, toilets, and colourful floors. So soon, very soon, the Dining Room Empire will change slightly. I will get my own sewing room (that room on the right there) and the baby gets his own room. I can't wait. A far ways from the New York loft experience, Cheryl! Can't wait to see. Luv that tile! You and hubby have worked long and hard to get this far - you deserve to be thrilled that the end is in sight. LOVE that floor! empathizing with other people's loss is important, but so is celebrating with other people when they are enjoying good things in their life. Congrats on being so close to a finish on your reconstruction project! And maybe reading your story will encourage someone else who is just starting on a similaar journey. We are still working on a redo from 2005 caused by hurricane rita. Dont feel guilty, finally getting it done should give hope!!! I'm celebrating for YOU! It's going to change EVERYTHING. It's amazing having your own space that you can just close the door on. So so happy for you. I can't wait to see your new space it will be so nice to have that for yourself! Congratulations on being in view of the finish line. I can't wait to see your new space. Just coming out the other side of Sandy here near Philadelphia, I am thrilled to see what you are accomplishing! After a lot of hard work, you deserve this!! Your work is going to pop in that room! I'm so excited for you. Renos and house maintenance are never finished it's a fact of life. It will be sew fun setting up your sewing space. Need help? How exciting! But what a ride! We turned our basement into a studio for me two years before I retired (at a very young 55). It is the best thing we ever did. I know your pain! We had to build a the basement to make your for my longarm. And we only had 1 week. But it looks great! You will love it! You know I love some good home design. I can't wait for all of the after photos! Glad you're finally seeing a light at the end of the tunnel. 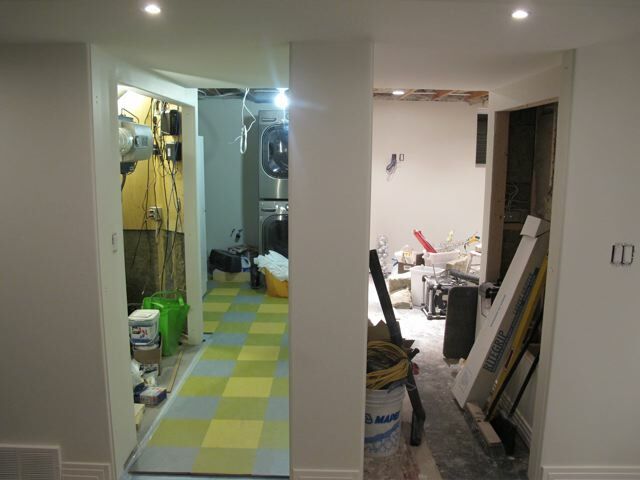 Congratulations on so much progress toward a wonderful basement! Glad there is light at the end of the tunnel!